After such a mild winter, why, oh why, did we choose the only truly FRIGID weekend to go fossil hunting along the Chesapeake Bay? 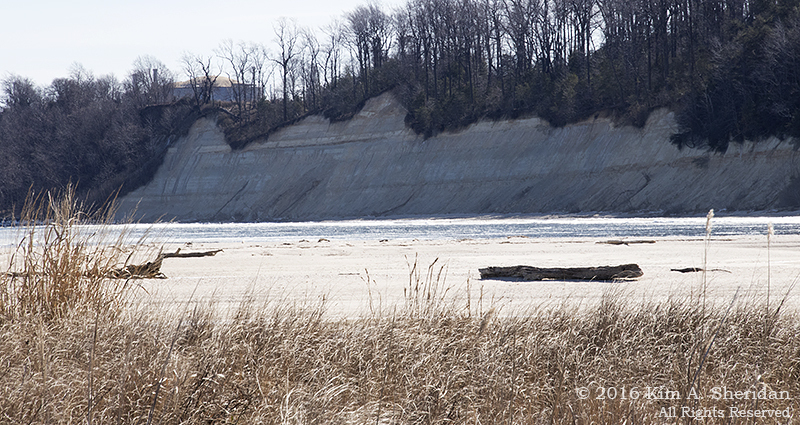 Calvert Cliffs on the western shore of Maryland is well-known for fossils, in particular fossilized sharks’ teeth. Dreaming of returning with fists full of teeth, Robb, Don and I spent a cold weekend on the Chesapeake Bay exploring Calvert Cliffs and other nearby sites. Take a little trip back in time, 15 million years ago. 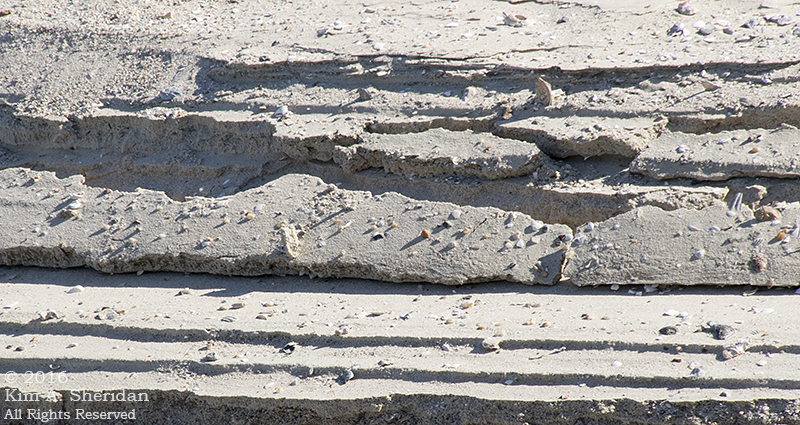 It’s the Miocene Epoch, and southern Maryland is covered by a warm shallow sea. In the sea swim ancient species of whales, porpoises, turtles, sea cows, and rays. Several species of shark, including the giant White Shark Carcharocles megalodon, feed on the vertebrate population. Ancient invertebrates inhabiting the seas include clams, oysters, crabs and corals. As each sea critter died, its carcass sank to the sea floor, to be covered with sand and silt. Generation after generation, the layers of bones accrued and fossilized. Fast forward to the present. 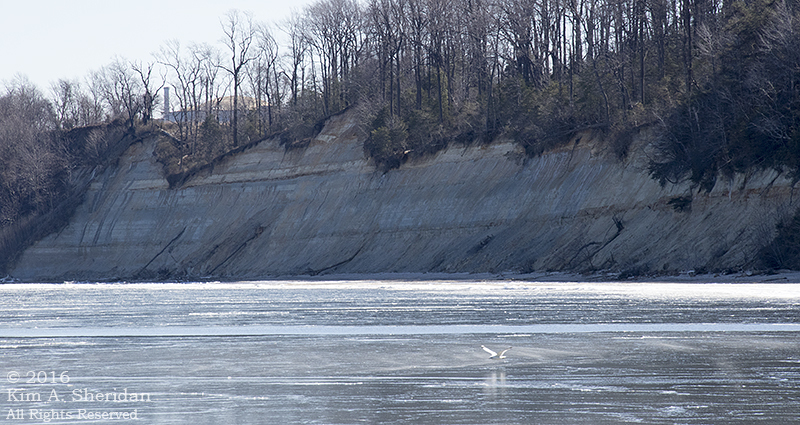 What was once sea floor is now a formation of clay, sandstone and shale cliffs known as the Calvert Cliffs stretching for miles along the western shore of the Chesapeake Bay. Imbedded in those cliffs are the fossilized remains of over 600 species of extinct Miocene animals. 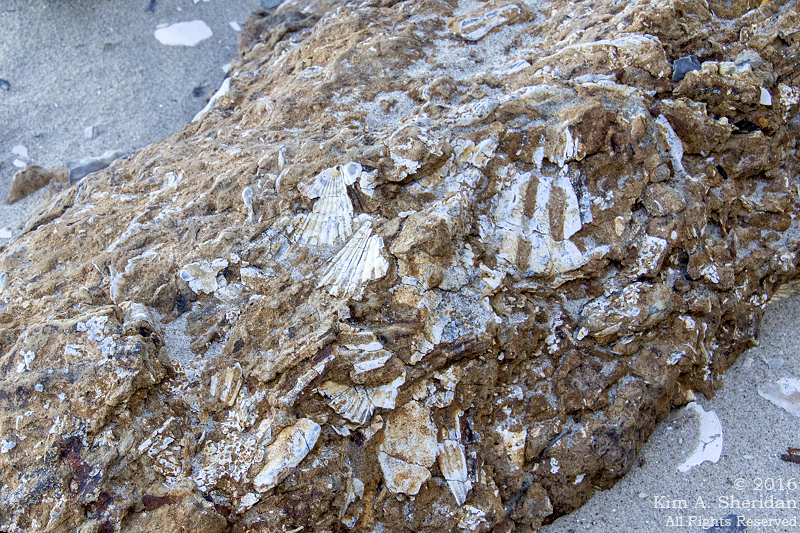 While the cliffs themselves are mostly on private property, there are a few public beaches where fossils appear – usually shells and corals – and the public is encouraged to fossil hunt. 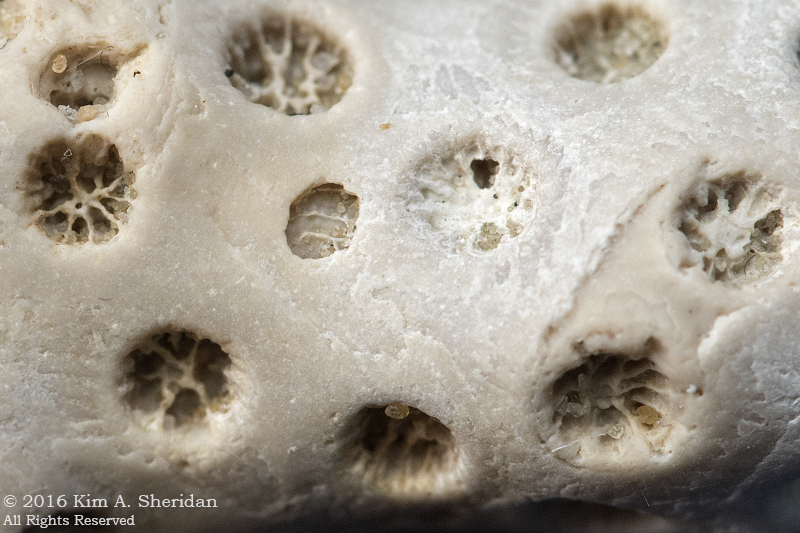 The real stars of the fossil hunt are the shark’s teeth. The teeth of extinct species of tiger, hammerhead, sand, and best of all Megalodon sharks can frequently be found here. FUN FACT: Sharks, both prehistoric and modern, have an unlimited supply of teeth, which they lose frequently and which are immediately replaced by already existing teeth. Over the course of millions of years, that’s a lot of sharks’ teeth falling to the sea floor. Don promised there would be “trillions” of fossilized sharks’ teeth out there for us to find. 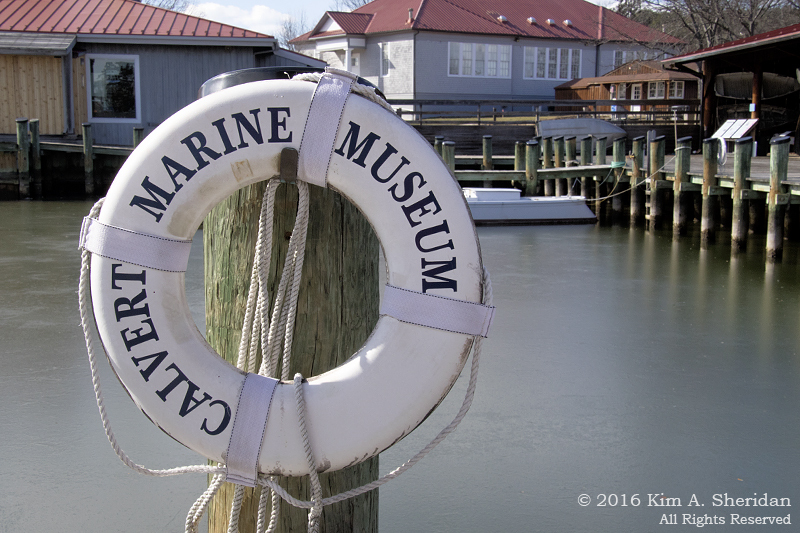 Our first stop was the Calvert Marine Museum in Solomons, Maryland. This was a great waterfront museum with an emphasis on natural and maritime history. We enjoyed the aquarium and other displays, but it was the fossil collection that we came to see. It was well worth the trip! There was a prehistoric time line, a reproduction of the Calvert Cliffs, and fossils of Miocene shells, sharks, whales, fish and crocodiles. Looming over it all was a HUGE replica of the extinct giant shark fondly known as Megalodon. We also toured the decommissioned Drum Point Lighthouse. Previously I have only seen tower lighthouses that stand on the shoreline. Drum Point is a screwpile lighthouse that once stood over the water off Drum Point. The octagonal structure encloses a two story cottage for the keeper and his family. Moored next to the lighthouse is the skipjack Dee of St. Mary’s. 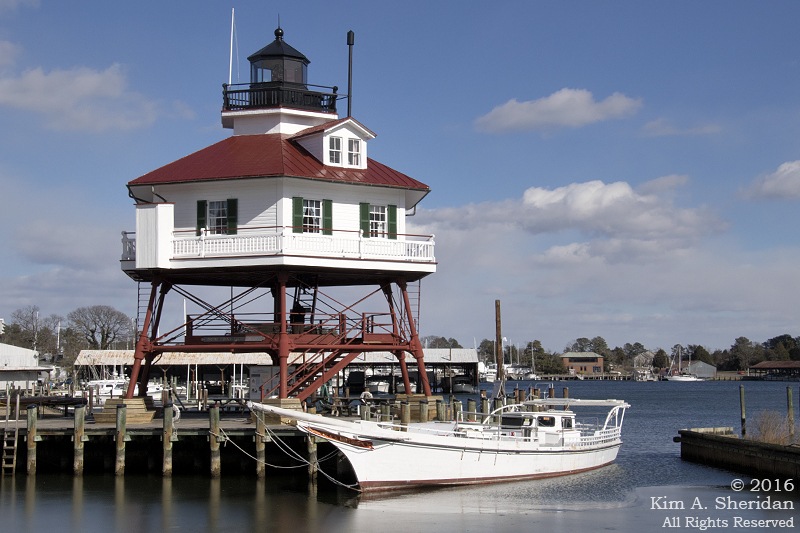 Skipjacks were used to dredge oysters from the Chesapeake Bay. The next afternoon we went to the beach near a portion of the Calvert Cliffs, hoping to find fossils. The gatekeeper showed us some fossils he’d found recently, petrified wood and a shark’s tooth. He said he’d found them yards out in the water, where the Bay is very shallow. Oops! Mistake #1: we left our muck boots at home. 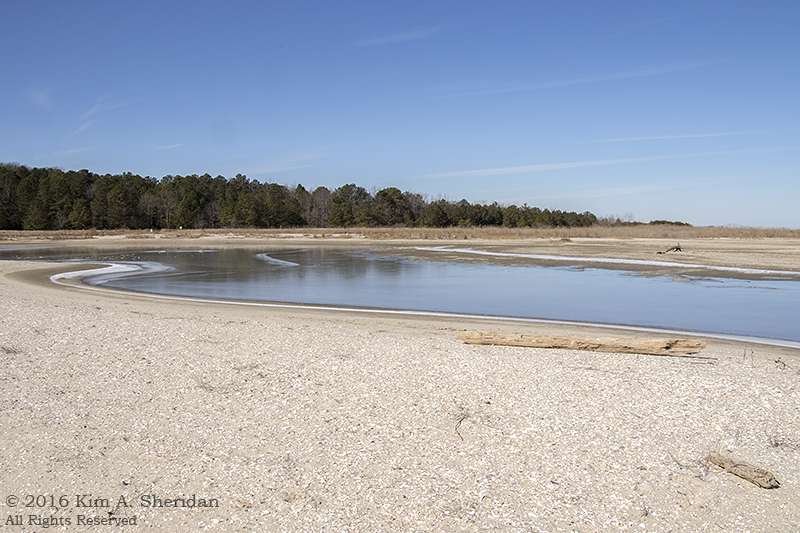 With temperatures hovering around 22° and a stiff breeze, there was no way we were walking in the water. The beach was unlike anything we’d seen before. Hundreds of yards wide, peppered with large pools and stands of beach grasses. We walked for a long way right at the edge of the water, looking for fossils and teeth. Trillions of sharks’ teeth? Nope. 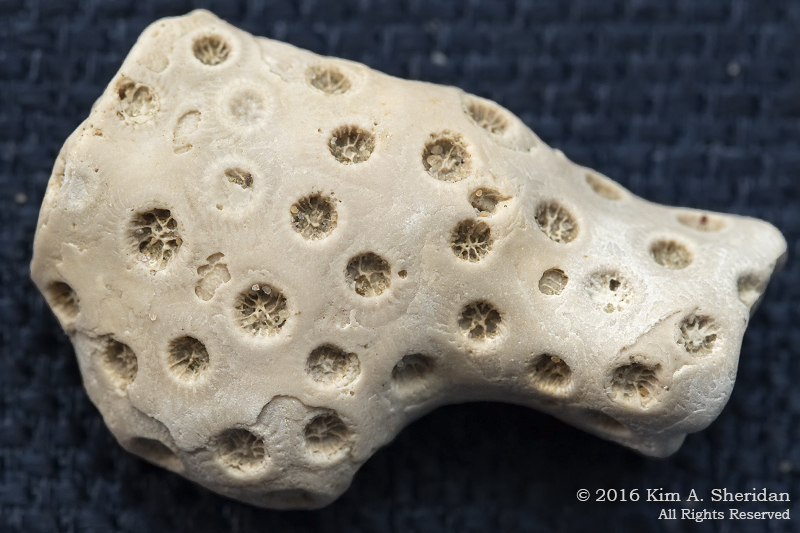 We did find a few of these fossilized corals, which I photographed at home later. Here’s a close-up of the coral. The cliffs south of us were dramatic. 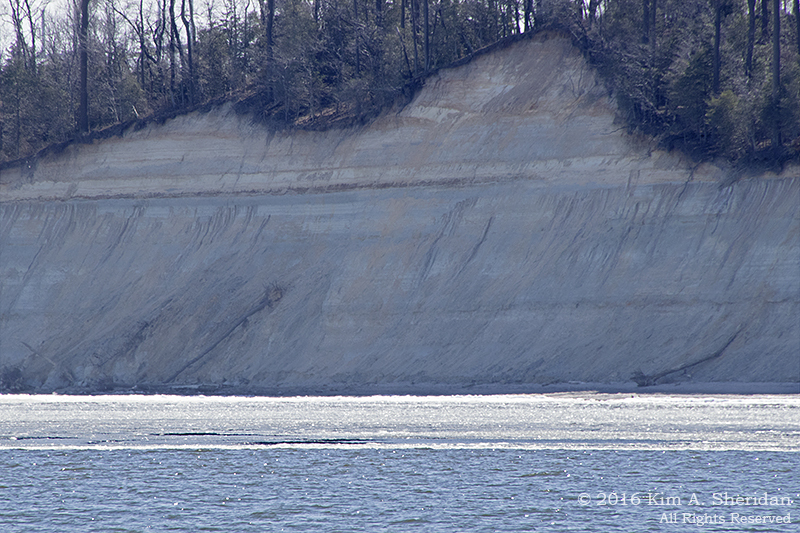 Even from a distance, the striations were obvious. It was also obvious that I’d made a miscalculation in suggesting the afternoon for this trek. I’d hoped it would be warmer. But the afternoon sun left the cliffs in deep shade, and none of my photos do them justice. Mistake #2. An island of terraced sand looked enticing. Surely there are shark teeth in those layers? But it was out of reach across the water. We’ll never know. We found rocks with fossilized clam and scallop shells embedded in them. Pretty cool. 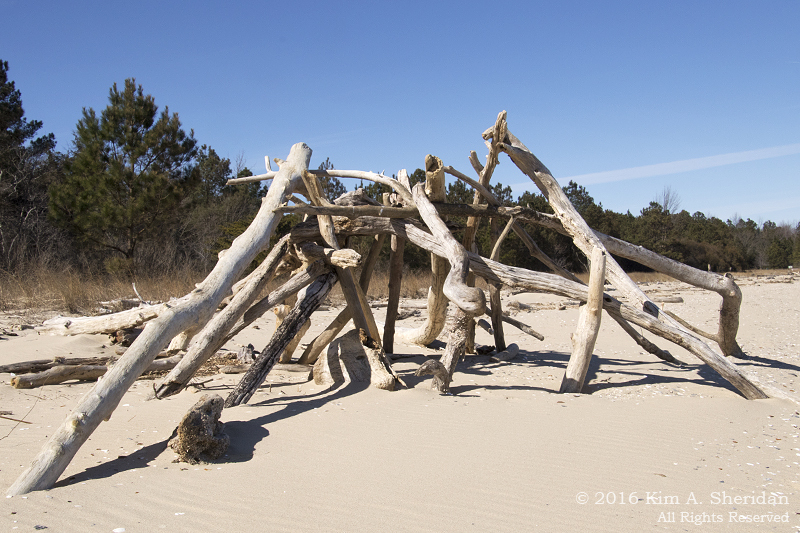 Beach sculpture. Again, humans’ need to create art wherever they are amazes me. In our exploration of the beach did we find trillions of sharks’ teeth? Nope. Not one. Coral, yes. Clam shells imbedded in rocks, yes. No matter. We explored a beach unlike others we’ve seen, saw some honest-to-goodness fossils, and marveled at the massive Calvert Cliffs. 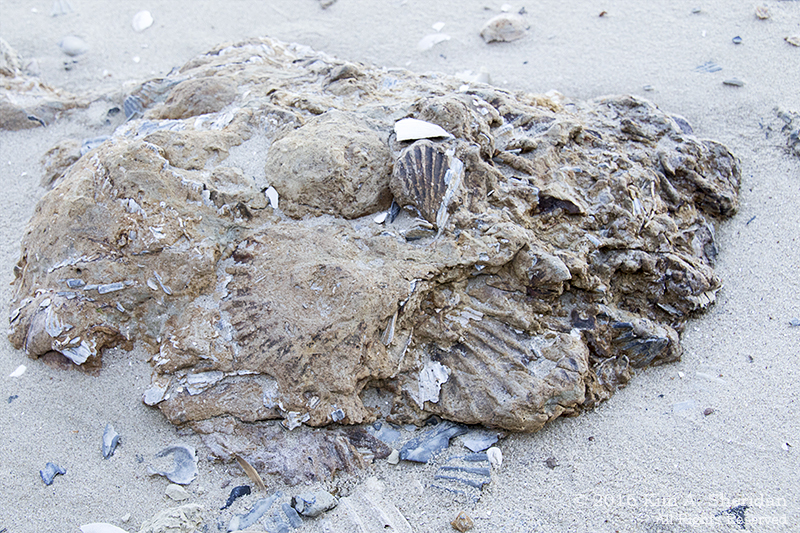 This entry was posted in Geology and tagged Chesapeake Bay, fossils, Geology by Kim. Bookmark the permalink.